Rough set theory is a new mathematical tool to deal with vagueness and uncertainty in artificial intelligence. Approximation accuracy, knowledge granularity and entropy theory are three main approaches to uncertainty research in classical Pawlak information system, which have been widely applied in many practical issues. Based on uncertainty measures in Pawlak information systems, we propose rough degree, knowledge discernibility and rough entropy in interval-valued information systems, and investigate some important properties of them. 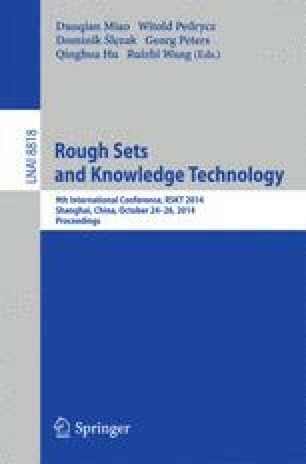 Finally, the relationships between knowledge granulation, knowledge discerniblity and rough degree have been also discussed.